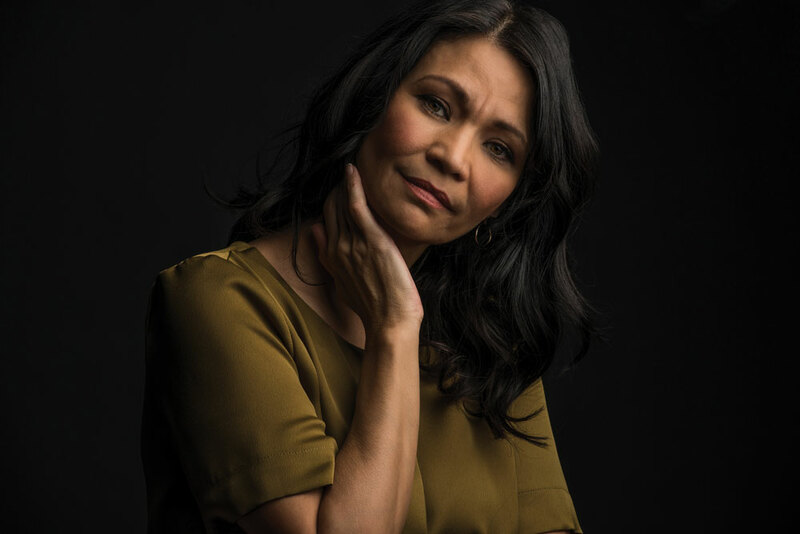 The acclaimed Calgary actor is a performer, producer and proud mom to the front women for the band The Basement Demons. On an overcast day in late September, Michelle Thrush is tucked into a corner at the Loop restaurant in southwest Calgary. Dressed in a dark sweater and slim jeans, the lovely actress blends in with the crowd but, thanks to the success of an Aboriginal Peoples Television Network (APTN) series called Blackstone, is becoming more recognizable by the day. Thrush plays Gail Stoney, an aboriginal woman who is dealing with her daughter’s suicide, not to mention her own shame, guilt and alcoholism. In 2011, Thrush won the Gemini Award for Best Performance by an Actress in a Continuing Leading Dramatic Role for her portrayal of Stoney. “At a really young age, I knew that what was happening in my home wasn’t normal,” she says. School was no safe haven, either. Thrush, who is part Cree, remembers times kids at Bowness High School would call her a “squaw” and harass her about her parents’ alcoholism. As the actress, who is perhaps best known for her roles on North of 60 and Arctic Air, reminisces, tears fill her eyes. Channelling those emotions for her work on Blackstone is difficult – and necessary. “I couldn’t skim the surface. I needed to dive into the pain,” says Thrush. Having now shot four seasons of Blackstone, she says the role continues to be hard but, in a way, is therapeutic. Thrush’s sense of belonging grew when she changed schools near the end of Grade 9, attending Plains Indian Cultural Survival School on 17th Avenue S.W. Though the school didn’t have a drama program, Thrush found something else there: a family. The school also gave Thrush the support she could not find at home, like the times staff let her nap on a couch at the back of the classroom when she hadn’t been able to sleep the night before. “What other school would do that?” she says. Thrush’s childhood hardships had a profound effect. Even after landing her first film role at the age of 17, she did not consider acting as a potential career; instead, she planned to devote her life to helping children through social work. When she met Gordon Tootoosis, the accomplished First Nations actor who would go on to become her father figure, he gave her a piece of advice that changed her life. “He told me, ‘If [acting] is what your heart wants, you need to follow it and be true,'” Thrush says. And she listened. With her parents finally sober and nothing tying her to Calgary, she moved to Vancouver when she was 20 and found an agent. During her five years in Vancouver, she landed bit parts and then spent two years doing theatre in Toronto. Thrush moved back to Calgary in the late 1990s for her role on North of 60 but kept her ties to theatre. In 2013, she co-directed and acted in the world premiere of Making Treaty 7, a show with both First Nations and non-aboriginal performers. All told, Thrush has amassed more than 40 television, theatre and film credits, working with actors including Benicio Del Toro (in 2013’s Jimmy P.) and Johnny Depp (in the cult classic Deadman), and has walked the red carpet at the Cannes Film Festival. Despite the credits and the awards, her desire to help children has never faded. In fact, she says acting has opened the door to helping in a way that social work could not. For the past 10 years, Thrush has travelled to aboriginal communities and shelters across Canada to perform as Majica, a therapeutic healing clown. Majica performs for young kids and teenagers, and also has a show for parents. Through her clown work, Thrush tackles serious subjects but also teaches kids to laugh, to respect themselves and each other and to dream. “It’s using the arts to empower and to heal,” she says. Thrush is passionate about the work she accomplishes with Majica. “I want to be a small part of contributing to that collective healing of our families. If I can do that, I will feel complete in my life,” she says. To help guide her daughters, Thrush is teaching them all of “the good stuff” she missed growing up. When her oldest daughter was 11, Thrush put her through rites of passage; a few women surrounded her in a sweat lodge and, afterward, a group had a feast where they gifted her with knowledge, offering wisdom on everything from how to treat her body to what it means to be a young, powerful female. Thrush plans to do the same or her youngest. Building a strong sense of identity in young people is key, she says, especially when most of them are looking to television and the Internet to learn what it means to be an adult. “I look at these young women today and they’re all trying to be Kim Kardashian,” she says. “It’s very, very sad.” For their part, Imajyn and Indica are certainly not trying to keep up with the Kardashians. The girls front a lo-fi punk/grunge band called The Basement Demons with two of their cousins, and have played at festivals such as Sled Island. Thrush chooses to live in Calgary not just because she loves the city, but so her daughters can be close to family. And close they are; the band’s name pays homage to where they practice: in their grandmother’s basement on the Tsuu T’ina Nation reserve. Thrush is a proud mom and attends all of The Basement Demons’ shows but knows better than to stand in the front row. Thrush says she raised her daughters to believe there are no limits on what they can accomplish – and she, herself, is poised to lead by example. Although her career until now has been strongly associated with her identity as an aboriginal woman, Thrush says she is eager to play a role that has nothing to do with being Native. She wants the same opportunity for every aboriginal actor. Thrush says she would be thrilled to star in a film that’s Blue Valentine-esque; all about the love and pain in relationships – with no discussion of her character’s race. Another goal is to produce her own 13-part parenting series for APTN. The project currently has the working title Families First, and she’s waiting to find out if she’ll get the green light to shoot.